I miss her crazy face now that her home and her life aren't right around the corner from me but that doesn't stop us from loving the stuffing out of each other. 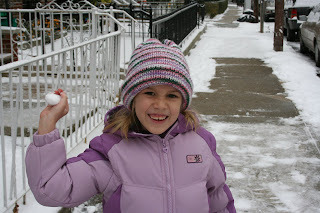 I remember the first snow after she could walk. Her mom brought her to the park and I met them so we could play because we were so sure that she would love snow. She couldn't have hated it more. She didn't even like to have her boots touch it so insisted on being carried. Luckily times have changed. We're going to Santaland on Sunday, as is our custom, I bet you'll be seeing that as another entry in this series. Well she is one cute little snowbunny. I hope you have fun at Santaland.